The Audi A4 is considered a good buy, especially for those who would like to go for a luxurious-looking sedan which is affordable at the same time. In fact, buying a used Audi A4 from the 1994 release has been an viable option for many. There are four body types one can choose from: the Sedan, the Avant, the A4L and the A4 All-road Quattro. There are also the B6 and B7 versions which were in a convertible style. 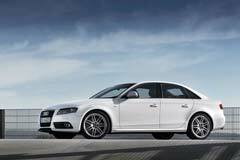 The main feature of the Audi A4 is the front engine which is longitudinally oriented. The Audi A4 was later re-launched in the market with a number of upgrades. The Audi A4 Avant was released in 2008. It was acclaimed as being one of the most popular cars in several countries, including Germany. The Audi A4 is a compact executive car that has been the choice for many, especially with its great performance and sleek design. 2011 A4 2.0T Premium Audi A4 with 43977 Miles, for sale!